The experience of Indore, India shows why bus rapid transit (BRT) lanes need to be separate from normal car traffic in order achieve its potential as a fast, efficient mode of transport. Photo by EMBARQ/Flickr. This article was originally published in the Deccan Herald on February 25, 2015. After five years of construction, Indore opened one of India’s few bus rapid transit (BRT) systems in May 2013. Operations started with a fraction of the total fleet planned, and yet, passengers exceeded 30,000 a day, a fourfold increase compared to the ridership of the regular city bus service that operated along the road before the BRT. But the bus lanes looked “empty” to the eyes of car drivers. Some car users, who are still a minority, felt something was wrong–that they should be allowed to drive in the bus lanes. A representative of this vision took the case to court and, in October 2013, a Division Bench ordered that cars were allowed to use the bus lanes, as a temporary measure until the case was solved. The result was appalling: traffic speed declined from 20 km/h to 13 km/h; traffic incidents became common, and demand for BRT declined substantially, jeopardizing the sustainability of the operations. BRT lost its charm, and rather than a symbol of progress and pride, became a dangerous trap. The intention to move people, not cars, was temporarily defeated. 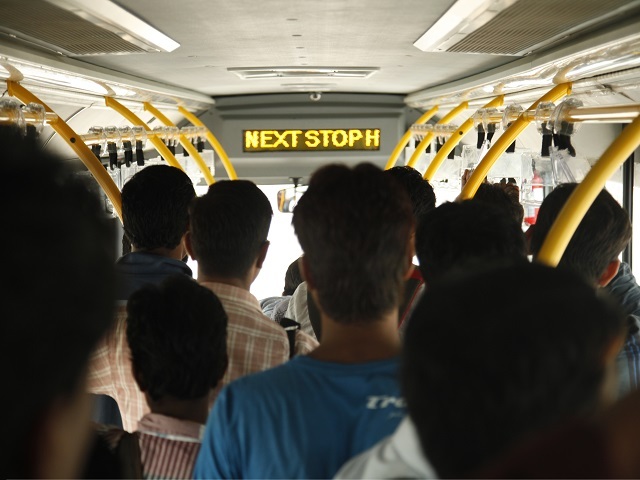 The Division Bench appointed an expert committee to look into the details of the BRT and recommend whether to keep the temporary order or reinstate bus exclusivity. The panel included members of the institutes of technology and management in Indore, a representative of the Ministry of Surface and Roads Transport, a social activist, and a senior advocate. They recommended that only iBus vehicles should use the BRT lanes, and at the same time made several suggestions for improving infrastructure and services in the corridor. The Division Bench of two members did not agree on the recommendations, with one judge inclined in favor of keeping cars in the bus lanes and the other following the indication of the committee. As the case was not solved, it was passed to the High Court of Madhya Pradesh, which made a final decision on January 23, 2015. The High Court decided to ban cars from the bus lanes, and closed the case. From now on, the corridor will be exclusive to iBus vehicles, and is expected to recover speed, safety and convenience to the public transport users, who happen to be the majority of people along the 11.4 km BRT corridor. With this ruling, the High Court challenges the conventional wisdom that roads are meant for moving cars, not necessarily maximizing people’s mobility, and suggests a type of city closer to European paradigms, where urban roads are designed with pedestrians, bicycles, and public transport in mind. The High Court ruling on BRT in Indore, which is preceded by a similar ruling in Delhi, confirms that this approach is closer to the needs of Indian cities. BRT was built in Indore to give priority to people in buses, and thus maximize the movement of people, not cars. Allowing cars in the BRT lanes was a mistake, based on the wrong understanding that roads are mainly for vehicular movement. c) Introduce additional crossings to prevent people jaywalking and jumping the fences, as they would need to walk very long distances otherwise. With this ruling, the legal system sits on the people’s side – favoring the majority of the people, not just those privileged enough to drive cars. These legal decisions are important precedents for many Indian cities planning BRT as part of integrated, multimodal, equitable public transport systems.